Call It What You Want, a stunning story collection inhabited by dreams and disappointments, good intentions and small triumphs, chronicles the lives of men lost in the liminal spaces between adolescence and adulthood. For all their flaws -- as husbands, as fathers, as friends -- the characters are portrayed with depth, tenderness, and humanity. Morris' writing has been compared to that of Denis Johnson, Richard Ford, and Richard Russo, and Call It What You Want balances realism with the surreal, humor with sadness, and explores all the hidden places in between. 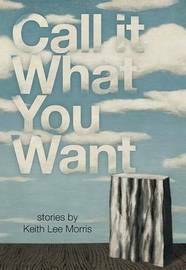 Keith Lee Morris is an associate professor of English and creative writing at Clemson University. His short stories have been published in Tin House, A Public Space, Southern Review, Ninth Letter, StoryQuarterly, New England Review, The Sun, and the Georgia Review, among other publications. The University of Nevada published his first two books, The Greyhound God(2003) and The Best Seats in the House (2004), and Tin House Books published his novel The Dart League King.